Sakai Community DocumentationSakai 12 Administrator Guide (English) PA SystemWhat is the PA System? The PA System tool provides system administrators with the ability to deliver customizable system-wide or targeted alerts to users in their Sakai instance. These alerts may take the form of dismissible, rich-text popup alerts or simple text banners, color-coded by alert priority. All alerts are centrally managed through the PA System tool within the Sakai Administration Workspace and can also be controlled via a set of RESTful APIs. 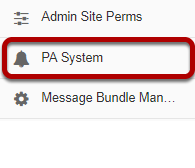 To access this tool, select PA System from the Tool Menu in the Administration Workspace. Prev: How do I refresh location, session, and server data? Next: How do I create a banner system message?